The cover on the left is downright misleading, because this is not a book about two girls frolicking around on the beach and having the time of their lives. Not at all. The cover on the right is a little closer to the feel of the book, but it’s still not quite right. To me, these girls look like friends — and Angel and Stella are NOT friends. But they do have to come together in a common purpose when tragedy strikes, because they’re both staying with Stella’s great-aunt Louise for the time being. Stella is there because her mother is deemed unfit to care for her. Angel is in the foster care system. Neither of them is happy to be there, but each has her own reasons for sticking around, even when they have the chance to leave. So, as you can see, this is not a playtime-at-the-beach sort of book. This is a book about missing your parents, making things work, and finding your way. One big crazy thing does happen in this story, but the rest of it is very quiet — like the beach in the cool silvery fog of the early morning. Summer of the Gypsy Moths is especially perfect for fans of Three Times Lucky and Because of Winn-Dixie, but I’d recommend it to anyone looking for a thoughtful and surprising story. 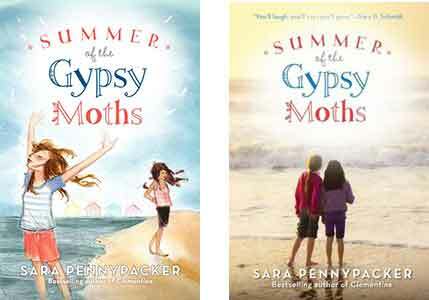 Have you read Summer of the Gypsy Moths or any books you think sound similar? Leave a comment and let me know! Or tell me what kind of beach experience is your personal favorite. Mine is watching the sun set over the Pacific! I definitely agree that the new cover captures the mood a bit better!